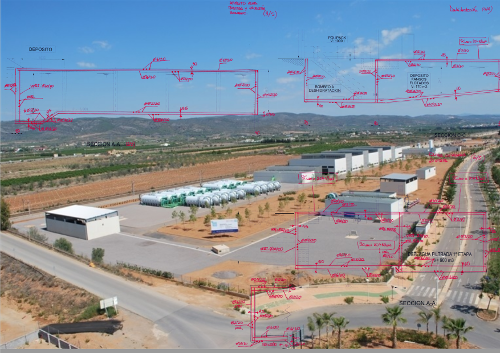 - Design verification of the structures included in the project of Campello and Mutxamel water distribution network, (Alicante), Spain. 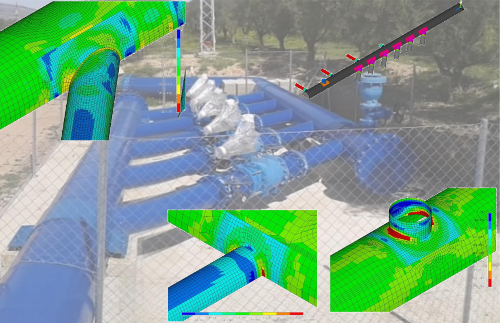 - Structural design verification of Tarfia pumping station for land drainage of the irrigation area B-XII in Lebrija (Sevilla), Spain. - Design of some structures for the Arabayona irrigation project (Salamanca), Spain. - Design and analysis of a 12000 m3 water tank for the Iregua River water purification plant, Logroño, Spain. - Structural design of a control building for Alto Aragón irrigation project, Huesca, Spain. - Structural design of five storm storage tanks in Madrid, Spain. - Feasibility study for the construction of several storm storage tanks in Valencia metropolitan area and Huerta, Spain. - Structural design of a pumping station and other civil works for Algarrabilla pond in the Bajo Guadalquivir irrigation area, Sevilla, Spain. - Design verification of the structures included in the project: Víboras water supply network, stretch: Fuentes de Martos - Martos water purification plant, Spain. - Design verification of the structures included in the project: Cuartanero-Pozoblanco water supply network, Córdoba, Spain. - Structural design of a pumping station and other civil works for Buitrago pond in the Bajo Guadalquivir irrigation area, Sevilla, Spain. 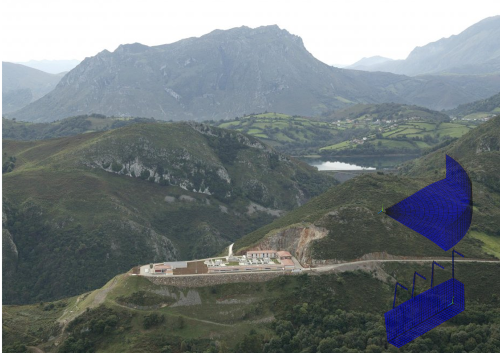 - Structural pre-design for the Aramo-Quirós water purification plant, included in the Oviedo water supply network, Spain. 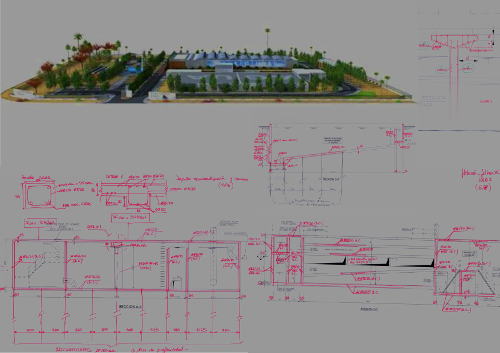 - Design verification of the structures included in the project: Esgueva valley water distribution network, Valladolid, Spain. 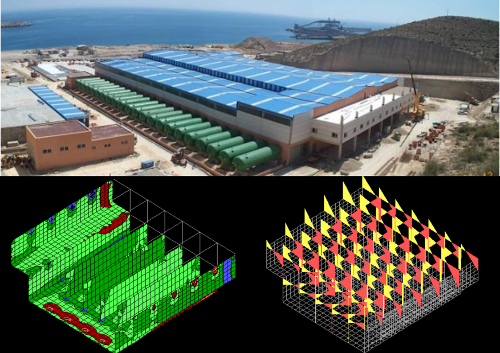 - Structural design of two buildings for the Benidorm-Finestrat desalination plant, Alicante, Spain. - Hydrologic study of Ramella stream for the construction of a wind turbine blade factory in Ferreira (Granada), Spain. - Hydrologic study and design of the embankment of Las Cárcavas stream in Casarrubuelos, Madrid. - Preparation of the budget for the construction of the Jiloca river dam in Teruel, Spain. - Preparation of the budget for the construction of the Breña II dam in Córdoba, Spain. - Feasibility study for the design of Cadalso de los Vidrios, Cenicientos, San Martín de Valdeiglesias and Rozas de Puerto Real sewage networks (Madrid), Spain. - Hydrologic study of Manzanares river, after the construction of a bridge for Madrid - Barcelona - France border AVE High-Speed Rail. Madrid, Spain. - Preparation of the budget for the construction of the Los Melonares dam in Sevilla, Spain. - Hydraulic and geometric design of the Cuenca Alta del río Louro sewage network in Pontevedra, Spain. - Feasibility study for the construction of the Cuenca Alta del río Louro sewage network in Pontevedra, Spain. - Feasibility study with the analysis of two alternatives for the construction of the Casares de Arbas dam in León, Spain. - Feasibility study with the analysis of two alternatives for the construction of Mar Menor sewage network , southern area, in Murcia, Spain. - Feasibility study with the analysis of two alternatives for the construction of Hoya de Guadix pipeline in Granada, Spain. - Preparation of the budget for the construction of Los Molinos dam, in Badajoz, Spain. - Feasibility study with the analysis of two alternatives for the construction of Fuente el Jarro and Paterna sewage treatment plants, in Valencia, Spain. - Feasibility study for the construction of Casas de Millán, Casas de Miravete, Jaraicejo, Malpartida de Plasencia, Mirabel, Serradilla, Serrejón, Toril, Torrejón el Rubio and Villarreal de San Carlos sewage treatment plants in Monfragüe nature reserve, Spain. - Feasibility study for the construction of Aljucén, Mirandilla, San Pedro de Mérida, Torrefresneda y Trujillanos sewage treatment plants in Cornalvo nature reserve, Spain. - Feasibility study for the construction of Bajo Bidasoa sewage treatment plant, in Hondarribia, Spain. - Feasibility study with the geometric design of the sewage network in Monfragüe nature reserve, Spain. - Feasibility study with the geometric design of the sewage network in Cornalvo nature reserve, Spain. - Feasibility study for the construction of Trubia sewage treatment plant, in Oviedo, Spain. - Feasibility study for the extension of Nigrán sewage treatment plant and sewage collection network, in Pontevedra, Spain. - Feasibility study for the construction of Rincón de la Victoria sewage treatment plant, in Málaga, Spain. - Hydraulic and geometric design of the irrigation system for the III and IV areas of Lorca, Murcia, Spain. - Feasibility study for the construction of Irueña dam, in Salamanca, Spain. Design of the highway drainage for Cartagena West road, Spain.